Elephant Atta is running a huge DVD giveaway in the weeks leading up to Ramadan rewarding consumers for their continued support. 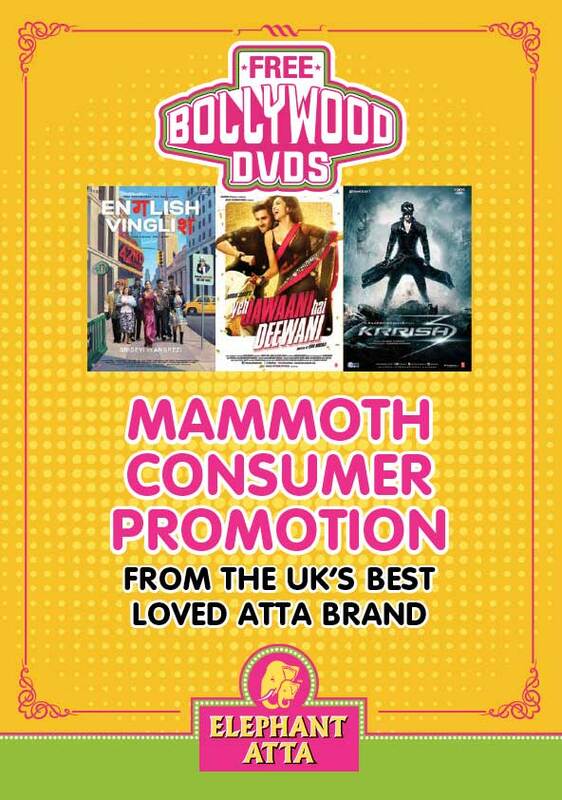 The campaign, which started in May, allows consumers who buy one 25kg pack of chapatti flour, or two 10kg packs, to send off for a free set of three Bollywood Mega Hit DVDs, aimed at giving the whole family some fun films to watch together. Krissh 3 – a superhero adventure for the whole family to enjoy. Consumers can send off for their DVDs via the post, or apply online through our brand new website. Recently launched, it offers Elephant Atta consumers a one-stop-shop for information, news, music and recipes. This new user-friendly website can be accessed on all devices, including iPads, iPhones Mac and PC at www.elephantatta.com.